Craggy Skellig Michael once drew in medieval monks looking for a remote retreat where they could focus on their faith without distractions. 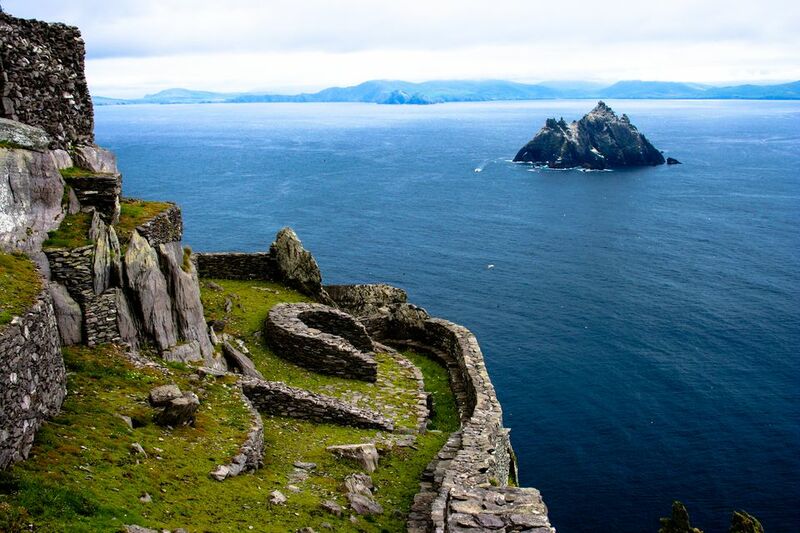 Thanks to Star Wars, the wild island off the coast of Kerry is now a major destination thanks to its newfound cinematic fame. If the green rocky archipelago looks familiar it is probably because Skellig Michael and nearby Little Skellig were the real-life backdrops for the imaginary Planet Ahch-to in "The Last Jedi" and "The Force Awakens." Ready to brave the sea to explore the otherworldly landscape? Here’s how to visit Skellig Michael. The first human settlement on Skellig Michael was founded by monks in the sixth century who traveled out to the remote archipelago to better connect with the divine. The monks used the local stone to build huts and terraced ledges, planting the small carved out areas with vegetable gardens to sustain themselves in the harsh climate. They also created a complicated system for purifying drinking water, some of which can still be seen today. In the 11th century, the monastery was dedicated to Saint Michael the Archangel and six new beehive huts were created. The round exterior of the huts protected an inner rectangular structure, and this unique shape helped to keep rain from entering inside. Experts estimate that no more than 12 monks ever lived on the island at any one time based on the number of dwellings. However, even those twelve souls abandoned the isolated island sometime around the 13th century due to a changing climate that brought more storms and a restructured church hierarchy which called them back to mainland Ireland. The Skelligs were used as a filming location for Star Wars episodes 7 and 8, "The Last Jedi" and "The Force Awakens." The Skelligs were portrayed onscreen as Ahch-To, a watery planet dotted with rocky islands in the Unknown Regions. In Star Wars, Ahch-To is the birthplace of the Jedi Order and Luke Skywalker’s home. In fact, the design of Luke’s home is based on the actual ruins of the sixth century monastery on Skellig Michael. Notable scenes that took places on Skellig Michael includes when Rey travels to Ahch-To to find Luke. The stairs that Rey climbs up to meet Luke in the Force Awakens are the same shale stone steps that really lead up to the early monastic ruins. The porg (sea bird) scene also takes place on Skellig Michael and was inspired by the puffins who visit the remote island every spring. While much of the Star Wars filming was done on location, the movie franchise also re-created the monastic backdrop on a movie set in order to protect the ruins. Skellig Michael is one of the most interesting protected archaeological sites in Ireland. A clear day will offer stunning views towards Little Skellig and across the sea, but the main thing to do on Skellig Michael is to visit the remains of St. Fionan’s Monastery. First, climb the 618 stairs carved into the rock in order to explore the beehive huts that were built here centuries ago. The main monastery area was built onto a terrace 600 feet above sea level, and the only way up is by foot. It is only recommended for people in good health and children must be supervised at all times. The hand-built walls that rim the terraces helped to ensure stability, as well as provide shelter from the harsh Atlantic winds. It is possible to walk through the site and admire the stone slabs and crosses that dot the hostile landscape. There is also an old cemetery located on Skellig Michael, as well as the hollowed-out shell of a church built in the Middle Ages. In addition to the monastery, which is a UNESCO World Heritage site, it might also be possible to spot puffins in late spring. The seabirds flock to Skellig Michael to lay eggs and raise their chicks. In fact, nearby Little Skellig is closed to the public because it is home to the second largest gannet colony in the world and is a protected bird sanctuary. There are no restrooms, cafes, or shelters on Skellig Michael so it is best to pack a backpack with food for lunch and come prepared for all sorts of weather. Skellig Michael is one of Ireland’s best islands and is located about 8 miles off the coast of Co. Kerry. It is only possible to visit Skellig Michael between May and October by reserving a seat with one of the approved boatmen listed on the Heritage Ireland’s website. Unfortunately, even if you manage to reserve one of the coveted seats on a boat heading out to Skellig Michael, all trips are completely dependent on the weather and you will need to wait until the morning of departure for the trip to be confirmed. The short visiting season is designed to overlap with the best weather and sea conditions but there are no guarantees when it comes to Atlantic storms. Hopefully, the tides and sunshine will be on your side. In that case, (depending on the boatmen you have booked with) boats leave from Portmagee, Valentia or Ballinskelligs. If you have not booked ahead, it might be worth stopping in early in the morning to see if anyone has canceled or failed to show up for their departure time. Most boats leave their Co. Kerry ports around 9:30 a.m. and return at 3:30 p.m. There is plenty to do nearby if your visit to Skellig Michael is canceled, or if you simply want to spend more time in the stunning County Kerry before and after the island outing. Take a short trip outside of the village of Portmagee to admire the sea and walk along the sand at Reencaheragh Strand. To catch a glimpse of the islands and look down towards Dingle, drive up to Coomanaspig Pass. If the crossing to the Skelligs is too rough, aim for Valentia Island instead. Valentia is connected to Portmagee by the Maurice O’Neill Memorial Bridge. The island is home to the Skellig Experience, an educative visitors center with information about the history and ecology of the Skelligs. Portmagee is one of the best stops to make while driving the Ring of Kerry, which means there are several other locations within easy reach. These include Ballycarbery Castle in Cahersiveen, Torc Waterfall, and Killarney National Park.